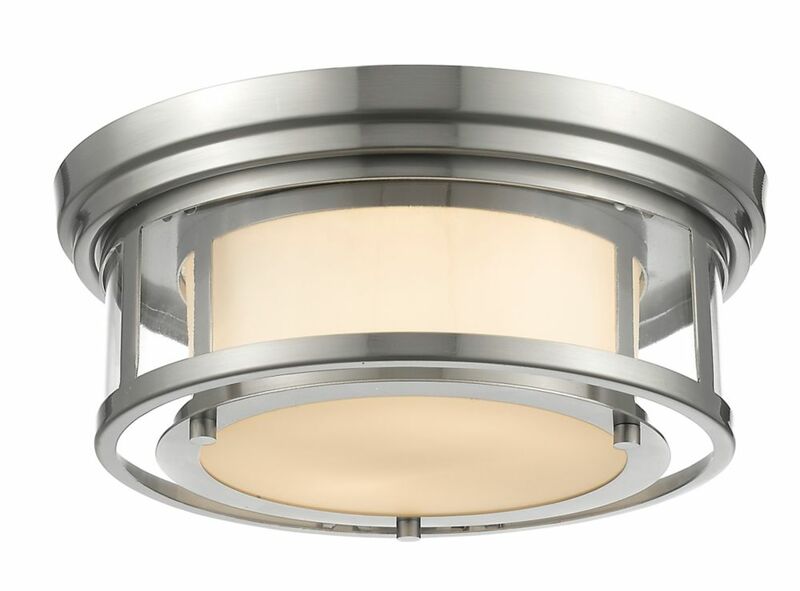 Acclaim Paige Indoor 2-Light Semi-Flush Mount in Satin Nickel with opal glass diffuser. Paige Is Clean And Easy going flushmount. A Simple Satin Nickel Frame With Compact hand blown Opal Glass Shades. A Charming, Modest Style in a satin nickel finish. Damp rated fixture. The cornerstone of the burton Collection is quality, and this semi flush mount is no exception. Combining a classic brushed nickel finish and posh styling, you will find no better way to highlight the charm of your home. With the superb craftsmanship and affordable price this fixture is sure to tastefully indulge your extravagant side. This Hampton Bay fluorescent ceiling light fixture features a durable brushed nickel finish and a sleek, modern design that compliments any décor. A white diffuser spreads soft light evenly throughout the room with a warm glow. 2-Light Brushed Nickel Flush Mount with Matte Opal Glass Shade(s) - 13 inch This flush mount will update your home with its eye-catching design. Featuring a brushed nickel finish and matte opal shade(s), this fixture will accommodate a variety of dicor styles. With its easy installation and low upkeep requirements, this flush mount will not disappoint.